FACT CHECK: Does NASA Data Show That Global Warming Isn’t Causing a Sea Level Rise? Does NASA Data Show That Global Warming Isn’t Causing a Sea Level Rise? 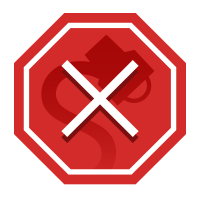 Dubious web sites generously provided the Internet with textbook examples of both cherry-picked data and the shameless conflation of weather with climate. A recent hiatus in sea level rise conflicts with the scientific consensus regarding global warming. NASA’s own data reveal that world-wide ocean levels have been falling for nearly two years, dropping from a variation of roughly 87.5mm to below 85mm. 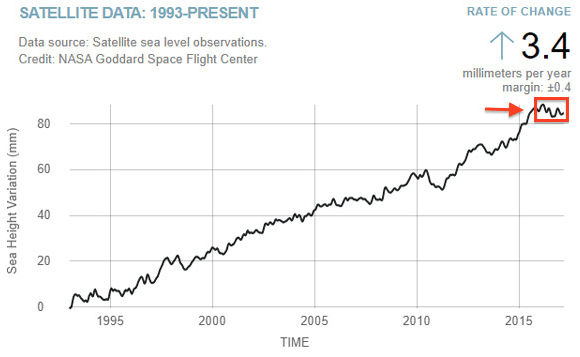 The NASA chart allegedly showing that sea level is not rising. Credit: NASA. The short term fall over the last year or so reported on the Natural News website is nothing out of the ordinary and in fact the fall seems less than several previous examples of sea level fall, such as [the drop documented in 2010-2011]. It does not seem to be a particularly noteworthy event. To understand why the event is not noteworthy, one needs to understand both the short- and long-term drivers of sea level change. From a long-term global perspective, there are two primary drivers of sea level rise: the first is the balance between water trapped in ice and water contained within the ocean itself. Simply put, when ice that is trapped on land melts, it increases the volume of water in the ocean, causing sea level to rise. The second major driver is known as thermal expansion — when water gets warmer it expands, increasing its volume. Research suggests that these two contributors alone explain 75 percent of the observed sea level rise since 1971. These larger trends, however, can be dampened (or enhanced) by shorter term weather patterns. The most important factors to consider on this time-scale are the El Niño-La Niña cycle (which affects both water temperature, as well as evaporation and precipitation of moisture) and the hydrological issues associated with where rainwater falls on land. The best illustration of these factors combining to alter the overall trend of sea level rise is the 2010-2011 drop in sea level mentioned above. In most cases, though, water that falls on land eventually drains into the ocean. Even if a whole lot of rain fell in South America’s Amazon, for example, it could slow sea-level rise for only about a couple of months, as it slowly made its way to the sea. Lake Eyre is the lowest point in Australia. It’s usually a dry, salty flat. But when it rains heavily, the basin fills, and the lake teems with new life, as long-dormant seeds spring to life and birds flock to the lake. From 2010 to 2011, enough rain fell on Australia to fill the lower part of the lake almost completely, and the upper portion at least 75 percent. Australia got about a foot of rain more than normal over that period, said [National Center for Atmospheric Research scientist John] Fasullo. Of course, this leveling does not conflict with our understanding of sea level rise and its main drivers. It is well known for example that sea level falls (in an anomalous sense) at the end of an El Niño due to drought subsiding over many tropical land areas such as the Amazon (water moves from the ocean to land surface) and heat being released from the ocean (as the tropical upper Pacific Ocean releases heat to the atmosphere, causing contraction). [The] recent leveling of sea level rise comes on the heels of an unprecedented rate of rise during the four years that preceded it (2011-14). In addition to global warming, this rise was also strongly influenced by the El Niño-La Niña cycle and so it too should not be oversold. One or two or three years of weather means very little in the long-term record of sea-level rise just as it would have very little meaning for global temperature records. Due to a variety of atmospheric circulation patterns and variations, temperatures vary from year to year as does rainfall, etc., the recent 4 year drought in the west is a good example. Using two years of data to make sweeping claims about trends in the global climate system, especially when such fluctuations are known and understood by science, is misleading and inaccurate, and as such we rank this claim as false. Natural News. 26 July 2017. Geophysical Research Letters. 4 October 2012. Scientific American. 20 August 2013.